Codeine is used to treat mild-to-moderate pain but it can also be used to stop diarrhoea and supress coughs. The Online Clinic is prepared to prescribe Codeine is certain circumstances for patients who need to manage pain. 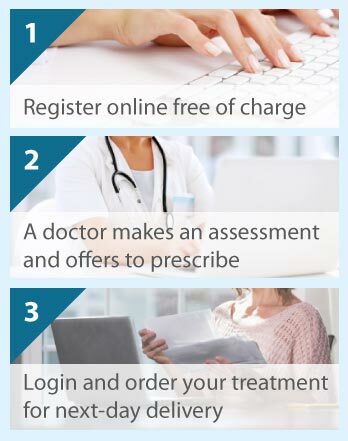 We can provide an online prescription after a short consultation form is completed on this website. All medications are sent for next day delivery. We have suspended the prescribing of Codeine and other codeine based treatments through this service. We can offer a non opioid treatment as an alternative. Please continue to a Pain Management consultation to have your case assessed by a GP. Codeine is one of the medicines known as opioid analgesics or painkillers, which is less potent than morphine. Its exact mechanism of action has not been discovered but its action is thought to be due to its conversion to morphine. In a similar way to morphine, it attaches to opioid receptors in the brain that transmit pain sensations. By acting on the nervous system, codeine also reduces gut movements (thus stopping diarrhoea) and suppresses the reflex causing cough. It is often used in combination with paracetamol or other painkillers. Codeine is available as a tablet, oral solution, linctus, and as an injection. Depending on what you are taking this medicine for, your doctor will prescribe the preparation and dose suitable for you. Your age, situation, and severity of symptoms will influence this decision. Tablets are swallowed with water, the oral solution and linctus are also swallowed, and injections are given by a hospital doctor into a muscle. It is often preferable to take oral preparations with or after food, and alcohol should not be consumed. A missed dose can be taken when you remember, but you should not take the missed dose and the next dose at the same time. Seek medical attention if you take more codeine than you should. All forms of codeine can be taken by adults and children over 12 years of age. As with all medicines, codeine may only be taken if you are not allergic to it or any of the other constituents in the preparation. Women who are pregnant or breast feeding must talk to their doctor about whether this medicine is suitable for them. Codeine is not for people with liver or kidney disease, who rapidly process codeine to morphine, have/have had a drug (particularly codeine or morphine; or alcohol) addiction or head injury, suffer severe headaches, or have problems with their breathing or bowels. Special care is warranted if you have any liver kidney and gut disorders, low blood pressure or heart problems, seizures, an under-active thyroid gland, phaeochromocytoma (adrenal gland tumour), and prostate and/or urinary problems. Because codeine interacts with other medicines, all your prescription and non-prescription medicines must be mentioned to your doctor. Codeine must be avoided if you are taking antidepressants known as monoamine oxidase inhibitors. Other medicines that may be an issue include other opioid analgesics or painkillers, sleeping pills (and other agents that make you drowsy), and medicines used to treat heart rhythm, depression, anxiety and other mental health problems, vomiting, and infection. Using codeine for a long time can lead to tolerance (you need higher doses or need to take it more often to gain an effect) or addiction (you get side effects if you discontinue it) or worsen headaches or irritable bowel syndrome. Immediately stop taking codeine and get medical help if you have allergic symptoms such as breathing problems, an itchy skin rash, or swelling of any facial feature. This medicine can cause your mood to fluctuate, with depression, anxiety, restlessness, hallucinations, and confusion, and cause gut problems such as nausea, vomiting, stomach pain and constipation. It may also result in sweating, dizziness and feeling faint, a rapid heartbeat, reduced libido and sexual performance, and in difficulties urinating.